You are here: Home / How Do YOU Weigh Up To The Stars? / How Do YOU Weigh Up To The Stars? How Do YOU Weigh Up To The Stars? Everyone HATES the scale. This one piece of equipment has the ability to either break OR make your day. Some people detest the scale so much that they don’t even own one! What if every time you stepped on the scale; instead of it telling you a number, it told you what celebrity weighs the same as you? 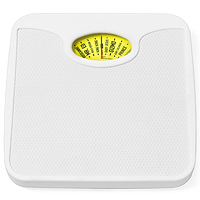 This new scale has hit the market and seems to have better reviews then the dreaded numeric scale. “It seems everyone is obsessed about their weight these days. Too fat, too thin, size zero this, obese that. The whole weight debate is enough to make you want to smash up the bathroom scales and start again. And that’s pretty much what the makers of the hilarious Celebrity Weighing Scales have done, because they’ve dispensed with traditional units of measurement and replaced them with the names of celebrities, historical figures and even a few calorifically-challenged fictional characters. With these deeply ironic scales you get to compare your weight with the likes of Fozzie Bear, Mr Ed (yes, the talking horse! ), Donald Trump’s Combover and even the Baby Jesus. Just think, with the Celebrity Weighing Scales in the bathroom you’ll be itching to step aboard, not dreading the prospect. After all numbers are so final, aren’t they? 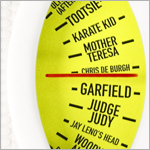 Even if you couldn’t give a fig about your weight, you’ll want to use these scales every day just to see which iconic figure you’re currently on par with. Of course most of us would prefer to achieve parity with Stephen Hawking ( sans wheelchair ) or Goldie Hawn, not Ron Jeremy or Half of John Candy. But even if the reading isn’t to your liking, at least you’ll have a giggle looking. Besides, in today’s celeb-centric society it’s rather comforting to know you weigh the same as King Kong or the Karate Kid. Sort of. If the scale wasn’t your favorite thing before … at least this one will give you a laugh first thing in the morning!! !